Excavation trench at the Eaker site, 2006. Light area is a sand filled earthquake feature. In the post-Cold War era, the U.S. Air Force decided to shut down the Eaker Air Force Base in Blytheville, AR. In order to give the property on which the base was located back to the local authorities, the USAF hired a cultural resource management firm to conduct a survey of the archeological sites on the base property (Cande and Lafferty 1991). The archeological sites identified during this survey were deeded to the city of Blytheville as part of the official closing of the base in 1992 (Department of the Air Force 1992). With the deeds to numerous archeological sites in hand, many of which were mostly undisturbed by farming due to having been part of the base since the 1940s, the people of the City of Blytheville saw that they had a unique opportunity to preserve and study these sites. One site in particular was in an excellent state of preservation and seemed to be a good representative of an under-studied time period. The Eaker site (3MS105) is located on the north side of the base where only a small amount of activity by the Air Force is recorded. It is a Middle Mississippian site that is rumored to have once had a mound, though no mound is currently visible. Because of the level of preservation of the site, as well as the time period that it represents, the site was nominated as a National Historic Landmark, an important distinction as there are just over 2500 such places in the country and only 14 in Arkansas (National Park Service 2017). The National Park Service and President Clinton agreed that the site was of national significance as a source of future research into the Middle Mississippian culture and the site was officially designated as such in June of 1996 (National Park Service 2017). 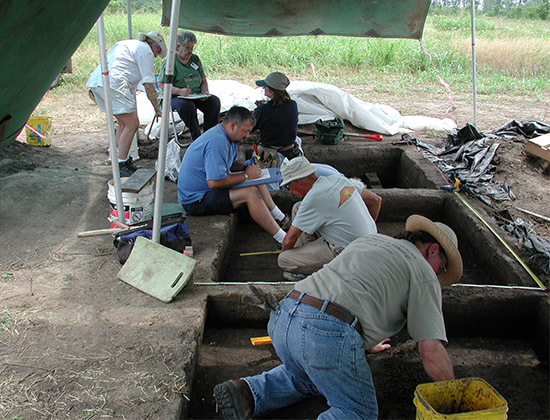 Units being excavated by Society volunteers at Eaker in 2006. In order to study this new National Historic Landmark, the Arkansas Archeological Survey, in conjunction with the City of Blytheville, opened the Blytheville research station of the Arkansas Archeological Survey in 1999. 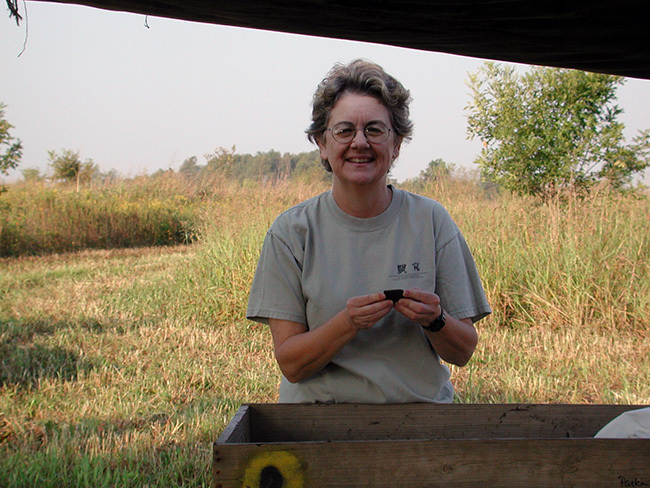 Dr. Claudine Payne, an expert on Mississippian mound centers, was hired to run the station and Marion Haynes, a local Arkansas Archeological Society member with vast knowledge of local archeology and land ownership, was hired as her assistant. After a few years of learning the ropes of being a station archeologist, Dr. Payne hosted the Arkansas Archeological Society/Survey Annual Training Program at the Eaker site in 2004, 2005, and 2006. During those three summers, thousands of artifacts were excavated and many Middle Mississippian structures were uncovered. This excavation added to our knowledge of the layout of Middle Mississippian sites, the many types of artifacts produced and used during this period, and ideas about the distance and extent of trade. It was also found that the site had been impacted by earthquakes after it had been abandoned, adding it to a growing list of earthquake affected sites in the region used to study paleoseismology. In addition to the large project at the Eaker site, the Blytheville station also oversaw projects in both Mississippi and Crittenden counties. This included salvage efforts at sites being land-leveled for farming purposes, unintentional archeological discoveries by local landowners, and help with historic cemetery preservation efforts. Dr. Payne was also instrumental in helping to start the Delta Gateway Museum on Main Street in Blytheville where archeological collections from local sites are currently on display. The museum is in the process of constructing a permanent, professionally built Native American exhibit that will discuss the long history of Native Americans in the region. 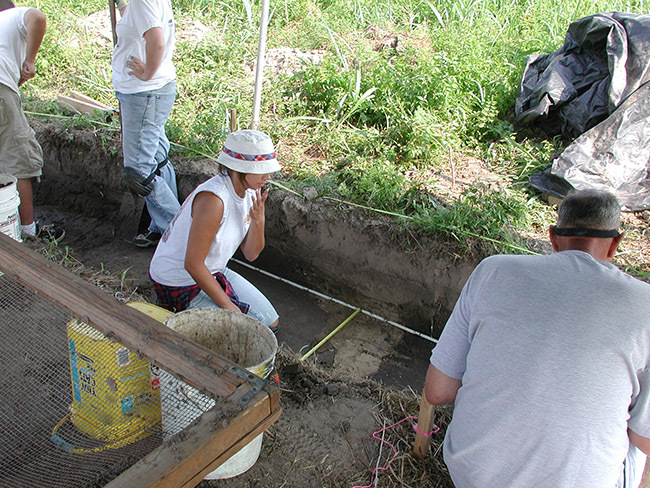 Dr. Claudine Payne at the Eaker excavation in 2005. 1991 Archeological Survey of Undeveloped Portions of Eaker Air Force Base Mississippi County, Arkansas. Mid-Continental Research Associates. Submitted to the U.S. Air Force Regional Civil Engineer AFRCE-BMS, Contract No. F04607-90-C0010. 1992 Draft Environmental Impact Statement. Disposal and Reuse of Eaker Air Force Base, Arkansas. 2017 National Historic Landmarks Program (accessed 5/22/2017).